Our team of experienced stylists are committed to maintaining the fresh, clean and healthy look of your wig. We offer services ranging from "just a trim," to a full wash, set and style. If you need any assistance at all in caring for your wig, stop by the store or feel free to give us a call and make an appointment. Whether you own a human hair or synthetic wig, bring your wig into our shop and we will have it washed, set, and styled for you. Kim's Wig Botik is committed to providing quick and quality service for our clients. We use premium products to keep your pieces looking new so they will continue to help you look and feel your very best. In addition to washing and styling your wig, we also offer several custom options. 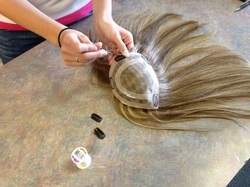 We can add clips, add highlights, thin out or thicken the amount of hair in your wig. Whatever you need to make your wig look as natural and comfortable as possible, we will get it done.